The Vaisakhi Festival (or also known as Baisakhi Festival) is the popular festival mainly celebrated in Punjab, India. This festival is an occasion of dancing, singing, music, wearing of festive garments. This day is also observed as the Thanksgiving day by the farmers whereby the farmers pay their tribute, thanking God for the abundant harvest and also praying for the future prosperity. Vaisakhi Festival is observed on 13th or 14th April every year. Vaisakhi is one of the major festivals of Sikhs and is celebrated with lot of enthusiasm and gaiety in the state of Punjab and all throughout the world where there is a significant Sikh population. For the large farming community of Punjab, Vaisakhi Festival marks the time for harvest of rabi crops and they celebrate the day by performing joyful bhangra and gidda dance. For the Sikh community, Baisakhi Festival has tremendous religious significance as it was on a Vaisakhi Day in 1699, that Guru Gobind Singh, the tenth Sikh Guru laid the foundation of Khalsa Panth-the Order of the Pure Ones. Guru Gobind Singh wished to instill courage and strength to sacrifice among his fellow-men. 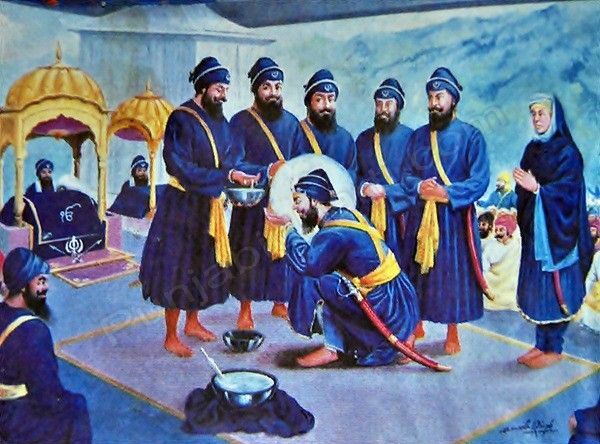 To fulfil his dream, Guru Gobind Singh called on the historic Vaisakhi Day congregation of Sikhs at Keshgarh Sahib near Anandpur on March 30, 1699. When thousands of people assembled for Guru’s blessing, Guru Gobind Singh came out of the tent carrying an unsheathed sword. He gave a powerful speech to infuse courage amongst fellowmen. At the end of the speech he said that every great deed was preceded by equally great sacrifice and demanded that anyone prepared to give his life come forward. On the Guru’s third call, a young man offered himself. The Guru took the man inside a tent and reappeared alone with a bloodied sword. Guru Gobind Singh asked for another volunteer. This was repeated another four times until a total of five Sikhs had gone into the tent with the Guru. Everyone present was worried and though that Guru Gobind Singh has killed five Sikhs. At this point Guru presented all the five men before the people. Every one present was surprised to see all five men alive and wearing turbans and saffron-coloured garments. The Guru blessed them with a Pahul ceremony. In an iron vessel, the Guru stirred with a sword called Khanda Sahib. The congregation recited verses from scriptures as the Guru performed the sacred ceremony. The water was now considered the sacred nectar of immortality called amrit. It was first given to the five volunteers, then drunk by the guru and later distributed amongst the crowd. With this ceremony, all those present, irrespective of caste or creed, became members of the Khalsa Pantha (the Order of the Pure Ones). People of Punjab celebrate the festival of Vaisakhi with exuberance and devotion. As the festival has tremendous importance in Sikh religion, major activities of the day are organized in Gurdwaras. People wake up early to prepare for the day. Many also take bath in the holy river to mark the auspicious occasion. After getting ready people pay a visit to their neighbourhood gurdwara and take part in the special prayer meeting organized for the day. This is followed by a guru ka langar or community lunch. Many people in India celebrate Vaisakhi by dancing, singing, dressing in holiday finery, observing wrestling bouts and enjoying the many parades that take place at this time. Men dance the Bhangra and women dance the Gidda to celebrate this event. People enjoy holiday foods and special treats such as kada prasad (a type of sweet). thanks Admin for this valuable information.